Whether you're an IT pro seeking a new opportunity, an up-and-comer on the lookout for a mentor or a veteran who wants to build out a network of colleagues, these four messaging etiquette tips detail the right (and wrong) way to communicate on LinkedIn. Maybe you're in the middle of a software deployment and need advice from someone who's been there. Perhaps you're seeking a new mentor to help you carve out a career path or improve an existing skillset. Either way, navigating LinkedIn's waters, which are full of HR representatives, recruiters, jobseekers and managers, isn't always easy. The key to successful connections with these different personalities lies in both the approach and the details of communication, according to Blake Angove, director of technology services at staffing company LaSalle Network. "LinkedIn doesn't just have to be for job seekers — there's value beyond that," he says. "It's built for professional networking, which makes it easy for you to effectively search out and connect with the professionals you're looking for, for a variety of reasons." Knowing how to reach out to people the right way can be the difference between ignored messages and ones that spark lasting relationships. Here's how to effectively connect with four key LinkedIn user types — hiring managers, mentors, other IT pros and former managers —along with tips on how to get what you want from them. 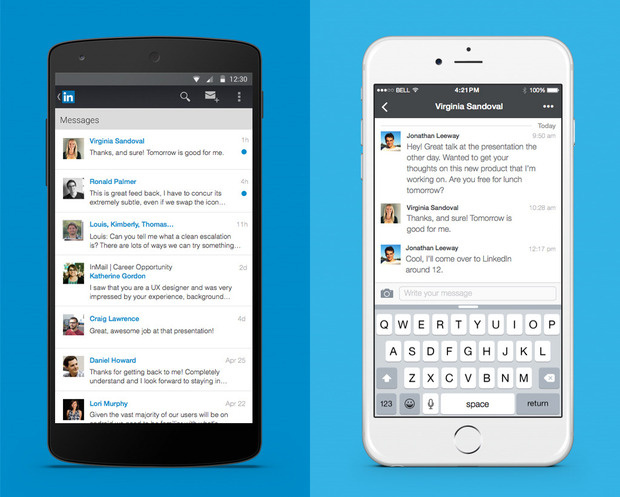 LinkedIn's messaging feature in its Android and iOS apps. You should first search for relevant Groups based on your location, according to Angove. This can help you find nearby professionals, cultivate relationship, and then seek out the most active users. "These are the people who are already in the mindset of being a mentor — they're already sharing, they're already teaching," he says. Using LinkedIn's Advanced Search feature, you can search by industry, title, location and keyword to narrow down results, according to Williams. When you find professionals that fit your criteria, reach out with purposeful messages. "Do you want that person to help you find a job? Make your skill set better?" Angove asks. "Once you identify that, craft your message around that goal." However, you shouldn't immediately ask people to be your mentor, Williams says. Instead, you should first attempt to establish a rapport. "Introduce yourself and compliment them on their career," she says. "Through several exchanges, you'll see that a mentor relationship is starting to form." If you're just starting a search for new technology vendors or are in the middle of a companywide software implementation, reaching out to other IT professionals who have successfully navigated the same terrain can provide a wealth of useful advice. "IT pros love to teach and share best practices and successes on projects, and by tapping into that you can gain a lot of value," Angove says. LinkedIn user Groups dedicated to projects similar to yours are good places to find likeminded pros, according to Angove. Connecting with Groups also lets you create dialogues with people you aren't directly connected to, and that helps build new relationships with potentially valuable contacts. "Just remember to keep it professional," he says. "Your questions and comments are visible to everyone in that group." If you're polishing or updating your LinkedIn profile to prepare for a new job search, recommendations from former colleagues are some of the most impactful additions, according to Williams. It's ideal to ask your current manager for such a recommendation right after you complete a successful project, but that's not always possible. When reaching out to former managers for recommendations after the fact, ask them to comment on your ability to perform in certain situations and provide specific examples, Williams says. "Feel free to send over bullets for them to use as inspiration," she says. "You want these references to speak to your range as an employee." It's also a good idea to request recommendations that speak to the specific responsibilities required for the job you're trying to land, according to Angove. "If you apply for a software development position, ask your manager to talk about writing and delivering code because that's most applicable to the job," he says.